If we are to believe the author’s own comments in his Livre dou Voir Dit (Book of the True Tale), by the time he wrote that work in the late 1360s, Machaut was regularly pestered for copies of his works. This mature dit is often considered Machaut’s masterpiece, and it certainly seems this was a project close to his heart. By its very title, the tale purports to be autobiographical: it relates a supposedly recent episode in the ageing poet-composer’s life, his love affair with a lady some forty years his junior. He names her, enigmatically, ‘Toute Belle’ (All Beautiful) but conceals her identity in an anagram, in which scholars have seen the name of a certain contemporary noblewoman, Peronelle d’Armentières. Although other of Machaut’s dits similarly treat the travails of love and cast the author in a leading role, the Voir Dit is distinctive in several ways. The author maintains the tale was written, at the lady’s request, around the existing letters and lyrics exchanged by the lovers. Scholarship has long been divided over Machaut’s claims regarding the work’s veracity but a compelling case has recently been made for its enclosing more than a grain of truth. The wealth of specific, and often spurious, details contained in the letters and the author’s apparent mis-ordering of these exchanges, together with many references to historical personages and known events all combine to suggest this represents more than pure fiction. 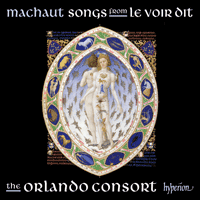 One aspect where Machaut was certainly economical with the truth, however, concerns certain of the lyrics and songs that are scattered throughout the work. The art of lyric composition lies at the heart of the tale. The lady first approaches our author, via an intermediary, with a request that he should train her in the craft of composing poetry and song. In the epistolary exchange that ensues, Machaut, the admired master poet-composer, instructs his young disciple in this gentle art. Over sixty lyrics pass between the two lovers over the course of the story, and these play a central role in the seduction process and in the subsequent unfolding of the love affair. Especially interesting for us today are the comments and insights regarding the production of these items found in the accompanying narrative and letters. Most of the lyrics and songs, variously attributed to Machaut or his lady, are presented as if newly composed, but in nine cases, including four by the lady, this is manifestly untrue because these items already figure in the first of the Machaut manuscripts, copied a decade or so earlier. Those items aside, the poetic efforts attributed to the lady have been judged rather less sophisticated in form and content than her master’s; whether or not these were indeed the work of a second poet or composed by Machaut remains a moot point. The nine songs that figure in the Voir Dit, on the other hand, were all evidently the work of Machaut himself: they are attributed to him in the tale and are found with their music amongst his other musical works in the surviving manuscripts. The first to appear is Plourés dames (Ballade 32), which Machaut probably wrote during the long illness he tells us he suffered over the winter of 1361 until the summer of the following year. Thinking he would succumb to this malady, he wrote this mournful song as his ‘testament’, and later sends it with his first letter to Toute Belle. He asks his charge to learn it since it isn’t difficult and he is most pleased with it. The song is in ballade form, the most expansive of the short ‘fixed’ forms favoured by poets and composers at the time, and one Machaut used for his more ambitious songs. Its text reflects the author’s sorrowful state: it begs ladies, whose honour he has served so tirelessly, to weep on his behalf and to dress in black to mark his imminent demise. The musical setting, like that of Ne que on porroit (Ballade 33) and Se pour ce muir (Ballade 36), is elaborate and sophisticated in style. Its texted melody, heard in the upper voice, is characterized by extensive melismas and is accompanied by an untexted duo that provides rich (and occasionally spicily dissonant) contrapuntal support. This song shares with Ne que on porroit three distinctive melodic motifs that are often heard in sequence: a short initial statement; a brief ascent that is often coupled with a downward leap; and a sinuous, melismatic descent, which Machaut had already explored in several earlier songs. Plourés dames and Ne que on porroit may seem to us remarkably similar in many ways but Machaut evidently felt he had created a quite distinctive, novel work with the latter. Ne que on porroit is certainly unusual for its motivic density and its constant repetition and variation, but it may have been the recurrent, striking descending leaps that led the author to remark he had designed it in ‘the German style’ (‘a la guise d’un res d’alemagne’). He concluded it was the best thing he had written for a long while, declaring its lower parts are ‘as sweet as unsalted gruel’. He implored his mistress to learn it exactly as written, with nothing added or taken away, and to perform it with ‘long measure’, meaning, perhaps, with a stately tempo; finally, he advised it could be performed on organ, cornemuse, or other instruments, since this reflects its true nature. The melismatic descent and downward leap motifs that feature prominently in Plourés dames and Ne que on porroit also permeate Se pour ce muir; the second of these also appears in modified guise in both Dis et sept, cinq (Rondeau 17) and in Dame, se vous n’avez aperceü (Rondeau 13). Such intricate sharing of musical material between these various songs lends rich insight into some of the materials preoccupying our composer in the early 1360s. The lyrics of certain of the Voir Dit songs betray a similar principle of recycling in Machaut’s compositional process. The text of Ne que on porroit grows out of material presented earlier in the narrative, while that of Dame, se vous n’avez aperceü is a collage of elements formerly used by the poet for some of his earlier lyric poems. In the case of Sans cuer dolens (Rondeau 4) the borrowing is wholesale: the author tells us he wrote this on the road after parting from his lady, but, in reality, he lifted it, ready-made, from his existing collection of poems and songs, simply modifying very slightly its text. The remaining three songs are each striking in their own way. Longuement me sui tenus (Lai 13/18) illustrates the form of the lai, which Machaut supposedly perfected. The lai, although archaic, continued to be revered in the fourteenth century as the most challenging and virtuosic of the lyric forms; Machaut was apparently amongst the last to set the form to music. These large-scale works were not just a challenge for the poet-composer, but also for the (usually) solitary singer who performs them: stamina, control, and endurance is required to deliver the twenty-four unaccompanied stanzas, as well as expressive powers to engage the audience throughout this technical tour de force. Puis qu’en oubli (Rondeau 18) is not explicitly named in the Voir Dit but it is included here because it seems a good candidate for a song that is alluded to in one of the letters. At his lady’s request, Machaut adds accompanying voices to a melody he had earlier supplied for one of her poems; this successive compositional approach may well account for the unusually low register and the rather awkward lines and chordal effect of the lower parts of Puis qu’en oubli. Finally, Quant Theseus / Ne quier veoir (Ballade 34) is a song of which Machaut was especially proud. The lyrics are the product of a competitive lyric ‘joust’ between Machaut and a certain Thomas Paien, one of the composer’s real-life peers at the cathedral of Rheims, which forms an interlude in the story. In the narrative, Machaut laments how Thomas composed his own lyric (Quant Theseus) first, thereby taking ‘all the grease from the pot’ in terms of poetic conceits and imagery. Machaut endeavoured to surpass Thomas’s effort by providing a greater number of extravagant images, many from classical mythology. But from his comments to his lady, it seems that where Machaut considered he had trumped his opponent was in the musical setting he crafted for the two poems. Quant Theseus / Ne quier veoir is unusual in its scoring for two equal texted voices over two accompanying lower voices. The novelty of this song and its lyrics may explain why these were imitated and quoted by a variety of Machaut’s contemporaries. Certainly, Machaut used his ‘True Tale’ not only to recount a love story and to play at the boundaries of fact and fiction, but also to showcase his talents as innovative composer of love-song. S’il faut en croire les commentaires qu’il fit dans son Livre dou Voir Dit, Machaut, quand il écrivit cette œuvre à la fin des années 1360, se vit régulièrement réclamer des copies de ses pièces. Ce dit de la maturité, qui est souvent regardé comme son chef-d’œuvre, fut apparemment un projet cher à son cœur. Autobiographique, comme le rappelle bien son titre, il relate un épisode soi-disant récent de la vie du poète-compositeur vieillissant: son histoire d’amour avec une dame de quarante ans sa cadette. Il la nomme, énigmatiquement, «Toute Belle» mais dissimule son identité dans une anagramme, où certains spécialistes ont décelé le nom d’une noble contemporaine, une certaine Péronelle d’Armentières. D’autres dits de Machaut traitent pareillement des tourments de l’amour et offrent à l’auteur un rôle central, mais le Voir Dit s’en démarque à plusieurs égards. L’auteur affirme qu’il fut écrit, à la demande de la dame, autour des lettres et des poèmes lyriques échangés par les amants. Les spécialistes ont longtemps été partagés quant aux assertions de Machaut sur la véracité de cette œuvre, mais des arguments convaincants ont été récemment avancés, qui prouvent qu’elle renfermerait plus qu’un soupçon de vérité. La profusion de détails, souvent apocryphes, contenus dans les lettres, et le mauvais ordre apparent des échanges établi par l’auteur, mais aussi maintes références à des personnages historiques et à des événements connus, tout cela concourt à suggérer que nous avons là plus qu’une pure fiction. Dans certains des poèmes lyriques et des chants émaillant l’œuvre, cependant, Machaut ne manqua sûrement pas de dire la vérité avec parcimonie. L’art de la composition lyrique est au cœur de ce dit. La dame commence par aborder notre auteur, via un intermédiaire, en le priant de la former à l’art de la composition. S’ensuit un échange épistolaire dans lequel Machaut, le magistral poète-chanteur admiré, instruit sa jeune disciple dans le doux art de la poésie et du chant. Les deux amants s’échangent ainsi plus de soixante poèmes lyriques, qui jouent un rôle central dans le processus de séduction et dans l’histoire d’amour à venir. Les commentaires et les idées sur la production de ces pièces, contenus dans le récit d’accompagnement et dans les lettres, sont, pour nous, des plus intéressants. La plupart des poèmes lyriques et des chants, diversement attribués à Machaut ou à sa dame, sont présentés comme des nouveautés mais, dans neuf cas (dont quatre de la dame), c’est manifestement faux, ces pièces figurant déjà dans le premier manuscrit de Machaut, copié quelque dix ans plus tôt. Ces pièces exceptées, les tentatives poétiques attribuées à la dame ont été jugées moins sophistiquées, dans la forme et dans le fond, que celles du maître; qu’elles aient été de Machaut ou d’un second poète, voilà qui reste à déterminer. Les neuf chants qui figurent dans le Voir Dit, en revanche, sont à coup sûr de Machaut lui-même: ils lui sont attribués dans le dit et figurent, avec leur musique, parmi ses autres œuvres musicales, dans les manuscrits, qui nous sont parvenus. Le premier à apparaître, Plourés dames (ballade 32), date probablement de la longue maladie dont Machaut dit avoir souffert durant l’hiver de 1361 jusqu’à l’été de l’année suivante. Pensant qu’il allait succomber, il écrivit ce chant sinistre en manière de «testament»—il l’enverra plus tard avec sa permière lettre à Toute Belle, en lui demandant de l’apprendre, puisqu’il n’est pas difficile et qu’il en est absolument satisfait. Il s’agit d’un chant en forme de ballade, la plus expansive des formes courtes «fixées», que privilégiaient alors les poètes et les compositeurs, et que Machaut utilisa pour ses chants plus ambitieux. Son texte reflète la tristesse de l’auteur: il prie les dames, dont il a si inlassablement servi l’honneur, de pleurer pour lui et de se vêtir de noir pour marquer son trépas imminent. Comme Ne que on porroit (ballade 33) et Se pour ce muir (ballade 36), ce chant présente une mise en musique stylistiquement complexe, sophistiquée. Sa mélodie avec texte, entendue à la voix supérieure, se caractérise par d’amples mélismes et s’accompagne d’un duo sans texte, qui apporte un riche soutien contrapuntique (d’une dissonance parfois piquante). Ce chant partage avec Ne que on porroit trois motifs mélodiques distinctifs souvent entendus à la file: une brève énonciation initiale, une courte ascension souvent couplée à un saut descendant, et une descente mélismatique sinueuse, déjà explorée dans plusieurs chants de Machaut. Même si Plourés dames et Ne que on porroit peuvent nous paraître remarquablement similaires, Machaut sentit à l’évidence qu’il avait conçu, avec la seconde, une œuvre résolument spécifique, originale. Ne que on porroit est assurément inhabituel par sa densité motivique comme par ses constantes répétitions et variations, mais ce sont peut-être ses récurrents et saisissants sauts descendants qui ont amené l’auteur à souligner qu’il s’agissait là d’un chant «dans le style allemand» («a la guise d’un res d’alemagne»). Il le conclut avec ce qu’il avait écrit de mieux depuis longtemps—ses parties inférieures sont, dit-il, «douces comme une bouillie d’avoine sans sel»—et il implora sa maîtresse de l’apprendre exactement comme il l’avait écrit, sans rien ajouter ni retrancher, et de le jouer «avec une longue mesure», signifiant peut-être par là avec un tempo majestueux; enfin, il conseilla de l’interpréter à l’orgue, à la cornemuse ou avec d’autres instruments à mêmes de refléter sa vraie nature. La descente mélismatique et les motifs de sauts descendants qui sont bien en évidence dans Plourés dames et dans Ne que on porroit imprègnent aussi Se pour ce muir; les motifs apparaissent également, mais sous un dehors modifié, dans Dis et sept, cinq (rondeau 17) et dans Dame, se vous n’avez aperceü (rondeau 13). Ce complexe partage de matériau musical entre différents chants nous offre un riche aperçu de ce qui préoccupait notre compositeur au début des années 1360. Les paroles de certains chants du Voir Dit trahissent un même principe de recyclage dans le processus compositionnel de Machaut. Le texte de Ne que on porroit naît du matériau déjà présenté dans le récit, tandis que celui de Dame, se vous n’avez aperceü est un collage d’éléments déjà utilisés par le poète pour certains de ses poèmes lyriques. Dans le cas de Sans cuer dolens (rondeau 4), l’emprunt est massif: l’auteur nous dit l’avoir écrit en chemin, après s’être séparé de sa dame, mais, en réalité, il l’a pris, tout fait, dans son recueil de poèmes et de chants, en en modifiant très légèrement le texte. Chacun des trois chants restants est saisissant à sa manière. Longuement me sui tenus (lai 13/18) illustre la forme du lai que Machaut, dit-on, perfectionna. Quoique archaïque, le lai continua d’être révéré au XIVe siècle comme la forme de poésie lyrique la plus stimulante et la plus virtuose; Machaut fut apparemment l’un des derniers à mettre cette forme en musique. Ces œuvres d’envergure défièrent le poète-compositeur comme elles défient l’interprète (généralement) solitaire qui les chante: résistance, maîtrise et endurance sont requises pour livrer les vingt-quatre strophes sans accompagnement, tout comme est nécessaire une puissance expressive à même de rendre ce tour de force technique séduisant pour le public. Bien que n’étant pas explicitement mentionné dans le Voir Dit, Puis qu’en oubli (rondeau 18) est inclus ici car il convient bien à un chant auquel une des lettres fait allusion. À la demande de sa dame, Machaut ajouta des voix accompagnantes à une mélodie déjà fournie pour un poème de la belle; cette approche compositionnelle par étapes pourrait expliquer le registre inhabituellement grave, les vers assez gauches et l’effet en accords des parties inférieures de Puis qu’en oubli. Pour finir, Quand Theseus / Ne quier veoir (ballade 34) est un chant dont Machaut était particulièrement fier. Ses paroles sont le fruit d’une «joute» lyrique entre Machaut et un certain Thomas Paien (l’un de ses authentiques pairs à la cathédrale de Reims), qui forme un interlude. Dans le récit, Machaut déplore que Thomas ait composé son poème lyrique (Quant Theseus) en premier, enlevant ainsi «toute la graisse du pot», tous les traits d’esprit et les images poétiques. Machaut s’efforça de supplanter Thomas grâce à un plus grand nombre d’images extravagantes empruntées, pour beaucoup, à la mythologie classique. Mais au vu des commentaires adressés à sa dame, c’est surtout avec la musique ciselée pour les deux poèmes qu’il estimait l’avoir emporté sur son adversaire. Quant Theseus / Ne quier veoir a une distribution insolite: deux voix égales avec texte par-dessus deux voix inférieures accompagnantes. Le caractère nouveau de ce chant et de ses paroles peut expliquer pourquoi tant de contemporains de Machaut l’imitèrent et le citèrent. Au vrai, Machaut utilisa son Voir Dit pour relater une histoire d’amour, pour jouer aux limites des faits et de la fiction, mais aussi pour faire montre de son talent à composer des chants d’amour novateurs. Wenn man den Kommentaren des Autors in dessen Livre dou Voir Dit (Buch der Wahren Geschichte) Glauben schenken darf, dann wurde Machaut, als er dieses Werk gegen Ende der 1360er Jahre schrieb, regelmäßig um Ausgaben seiner Werke bedrängt. Dieses reife Dit wird weithin als Machauts Meisterwerk betrachtet, und es scheint ihm auch selbst ein Herzensanliegen gewesen zu sein. Schon der Titel deutet autobiographischen Inhalt an: es ist darin von einer offenbar aktuellen Episode im Leben des alternden Dichterkomponisten die Rede, nämlich seine Liebesaffäre mit einer etwa 40 Jahre jüngeren Dame. Er bezeichnet sie enigmatisch als „Toute Belle“ (Ganz Schöne), versteckt ihre Identität jedoch in einem Anagramm, das die Forschung als Name einer gewissen zeitgenössischen Adeligen identifiziert haben will: Peronelle d’Armentières. Obwohl andere Dits von Machaut ebenfalls von den Mühen der Liebe handeln und der Autor in der Hauptrolle erscheint, hebt sich das Voir Dit in verschiedenerlei Weise davon ab. Der Autor behauptet, dass die Geschichte auf die Bitte der Dame hin niedergeschrieben wurde und sich auf vorhandene Briefe und lyrische Zeilen, die das Liebespaar einander geschrieben hat, bezieht. In der Forschung war man lang geteilter Ansicht, ob Machauts Behauptungen bezüglich des Wahrheitsgehaltes dieses Werks zutreffend sind, doch sind kürzlich schlagende Beweise dafür geliefert worden, dass hier doch mehr als nur ein Körnchen Wahrheit enthalten ist. Die Fülle von spezifischen und oft fadenscheinigen Details, die sich in den Briefen finden, die offenbar bewusst unchronologische Anordnung dieses Briefwechsels sowie die zahlreichen Anspielungen auf historische Personen und bekannte Ereignisse deuten alle darauf hin, dass es sich hier um mehr als reine Fiktion handelt. Ein Aspekt jedoch, bei dem Machaut etwas sparsam mit der Wahrheit umging, betraf gewisse Texte und Lieder, die durch das Werk hinweg eingestreut sind. Die Kunst der lyrischen Komposition bildet das Herzstück der Geschichte. Zunächst wendet sich die Dame über einen Vermittler an unseren Autor und bittet ihn darum, sie in der Kunst des Komponierens von Gedichten und Liedern auszubilden. In dem darauffolgenden Briefwechsel unterweist Machaut, der vielbewunderte Meister-Dichterkomponist, seine junge Schülerin in dieser sanftmütigen Kunst. Mehr als 60 Texte werden im Laufe der Handlung zwischen dem Liebespaar hin- und hergereicht und es spielen diese eine zentrale Rolle in dem Prozess der Verführung und der sich anschließend entwickelnden Liebesbeziehung. Von besonderem Interesse für uns heutzutage sind die Kommentare und Erkenntnisse bezüglich des Erstellens dieser Texte und Lieder, die sich in den beigefügten Briefen und Schilderungen finden. Der Großteil der Texte und Lieder, die mal Machaut, mal seiner jungen Dame zugeschrieben sind, ist so präsentiert, als handele es sich jeweils um Neukompositionen. In neun Fällen jedoch, vier davon von der Dame, ist dies offenkundig falsch, da diese Werke bereits im ersten Machaut-Manuskript, das mindestens zehn Jahre zuvor kopiert wurde, enthalten sind. Abgesehen von diesen Nummern werden die poetischen Bemühungen, die der Dame zugeschrieben sind, in Form und Inhalt als weniger anspruchsvoll betrachtet als diejenigen ihres Meisters—ob sie tatsächlich das Werk eines zweiten Dichters waren oder von Machaut komponiert wurden, ist nach wie vor ein Streitpunkt. Die neun Lieder hingegen, die im Voir Dit vorkommen, stammen alle ganz offensichtlich aus Machauts Feder: sie werden ihm in der Geschichte zugeschrieben und finden sich auch in seinen anderen musikalischen Werken in den überlieferten Manuskripten wieder. Das erste ist Plourés dames (Ballade 32), das Machaut wahrscheinlich während seiner langen Krankheit schrieb, an der er eigenen Angaben nach vom Winter 1361 bis zum Sommer des folgenden Jahres litt. In dem Glauben, dass er dieser Krankheit erliegen würde, schrieb er dieses schwermütige Lied als sein „Testament“ und verschickt es später zusammen mit seinem ersten Brief an Toute Belle. Er bittet seine Schülerin, es zu lernen, da es nicht schwierig und er damit besonders zufrieden sei. Das Lied steht in Balladenform—die umfangreichste der kurzen „festgelegten“ Formen, die von den Dichtern und Komponisten der Zeit bevorzugt wurde, und die Gattung, die Machaut für seine anspruchsvolleren Lieder verwendete. Der Text reflektiert den jammervollen Zustand des Autors: die Damen, deren Ehre er so unermüdlich gedient hat, werden gebeten, ihn zu beklagen und anlässlich seines bevorstehenden Todes schwarze Kleider anzulegen. Die Vertonung, ebenso wie die von Ne que on porroit (Ballade 33) und Se pour ce muir (Ballade 36), ist sorgfältig ausgearbeitet und stilistisch anspruchsvoll. Die mit Text unterlegte Melodie, die in der Oberstimme zu hören ist, zeichnet sich durch ausgedehnte Melismen aus und wird von einem nicht textierten Duo begleitet, das reichhaltigen (und zuweilen pikant-dissonanten) kontrapunktischen Rückhalt bietet. Dieses Lied teilt drei markante melodische Motive mit Ne que on porroit, die oft in Sequenzen zu hören sind: eine kurze Figur zu Beginn, ein knapper Aufstieg, der oft mit einem abwärts gerichteten Sprung kombiniert ist, sowie ein geschmeidiger, melismatischer Abstieg, den Machaut bereits in mehreren früheren Liedern ausgearbeitet hatte. Plourés dames und Ne que on porroit mögen uns in vielerlei Hinsicht ähnlich vorkommen, doch war Machaut offensichtlich der Überzeugung, dass er mit dem Letzteren ein besonderes, ein markantes und neuartiges Werk geschaffen hatte. Ne que on porroit ist sicherlich aufgrund seiner motivischen Dichte und der ständigen Wiederholungen und Variationen ungewöhnlich, doch waren es möglicherweise die wiederkehrenden, bemerkenswerten abwärts gerichteten Sprünge, die den Autor zu der Bemerkung veranlassten, er habe es im „deutschen Stil“ („a la guise d’un res d’alemagne“) geschrieben. Er zog die Schlussfolgerung, dass dieses Stück seine beste Komposition seit Längerem sei und erklärte, dass die Unterstimmen „so süß wie ungesalzener Haferschleim“ seien. Er bat seine Geliebte inständig darum, es genauso zu lernen, wie es notiert sei, nichts dazu zu tun und nichts wegzunehmen, und es mit „langem Maß“ auszuführen, was möglicherweise so viel wie „in getragenem Tempo“ bedeutete. Schließlich wies er darauf hin, dass es von der Orgel, der Cornemuse oder anderen Instrumenten ausgeführt werden könne, da dies seine wahre Natur widerspiegele. Der melismatische Abstieg und das abwärts gerichtete Sprungmotiv, die beide häufig in Plourés dames und Ne que on porroit vorkommen, ziehen sich auch durch Se pour ce muir; das zweite dieser Stilmittel erscheint dazu in etwas abgewandelter Form sowohl in Dis et sept, cinq (Rondeau 17) als auch in Dame, se vous n’avez aperceü (Rondeau 13). Dass diese verschiedenen Lieder in derart komplizierter Weise miteinander verbunden sind, gibt einen tiefen Einblick in die Art von musikalischem Material, welches den Komponisten zu Beginn der 1360er Jahre beschäftigte. Die Texte gewisser Lieder aus Voir Dit lassen auf ein ähnliches Wiederverwertungsprinzip schließen wie bei den Kompositionen. Der Text von Ne que on porroit entstand aus Material, das zuvor in der Erzählung auftrat, während derjenige von Dame, se vous n’avez aperceü eine Collage von Elementen ist, die der Dichter vormals für seine früheren lyrischen Gedichte verwendet hatte. Im Falle von Sans cuer dolens (Rondeau 4) sind die Anlehnungen umfassend: der Autor erklärt, dass er es unterwegs komponiert habe, nachdem er seine Dame verlassen hatte, doch in Wirklichkeit entnahm er es vollständig aus seiner vorhandenen Sammlung von Gedichten und Liedern und wandelte einfach den Text leicht ab. Die verbleibenden drei Lieder sind alle auf ihre Weise eindrucksvoll. Longuement me sui tenus (Lai 13/18) illustriert die Gattung des Lai, die Machaut angeblich vollendete. Der Lai wurde, obwohl es sich dabei um eine bereits altertümliche Form handelte, im 14. Jahrhundert als eine der herausforderndsten und virtuosesten lyrischen Gattungen betrachtet und Machaut war offensichtlich einer der Letzten, der sie vertonte. Diese großangelegten Werke stellten nicht nur für den Dichterkomponisten eine Herausforderung dar, sondern auch für den (meistens) einzelnen Sänger, der sie ausführt: Ausdauer, Kontrolle und Durchhaltevermögen sind hier vonnöten, um die vierundzwanzig unbegleiteten Strophen vorzutragen, und zudem eine gewisse Ausdruckskraft, mit dem das Interesse des Publikums während dieser technischen Tour de Force aufrechterhalten werden muss. Puis qu’en oubli (Rondeau 18) wird im Voir Dit nicht explizit aufgeführt, liegt jedoch hier vor, da die Möglichkeit besteht, dass es sich hierbei um ein Lied handelt, auf das in einem der Briefe angespielt wird. Auf die Bitte seiner Dame hin fügt Machaut Begleitstimmen einer Melodie hinzu, die er zuvor für eines ihrer Gedichte bereitgestellt hatte; dieser kompositorische Ansatz in Etappen mag durchaus der Grund für das ungewöhnlich tiefe Register, die recht heiklen Linien und den akkordischen Effekt der tieferen Stimmen in Puis qu’en oubli sein. Quant Theseus / Ne quier veoir (Ballade 34) schließlich ist ein Lied, auf das Machaut besonders stolz war. Der Text, der ein Zwischenspiel in der Geschichte ist, ist das Ergebnis eines lyrischen „Turniers“ zwischen Machaut und einem gewissen Thomas Paien, ein Kollege des Komponisten aus dem wirklichen Leben, der an der Kathedrale zu Reims tätig war. In der Erzählung beschwert sich Machaut, dass Paien seinen Text (Quant Theseus) zuerst komponierte und damit „alles Fett aus dem Topf abschöpfte“, was dichterische Einfälle und Metaphern anging. Machaut bemühte sich darum, Paiens Leistung zu übertreffen, indem er extravagante Sinnbilder, hauptsächlich aus der klassischen Mythologie, in noch größerer Zahl einsetzte. Den Kommentaren, die an seine Dame gerichtet sind, kann man jedoch entnehmen, dass Machaut glaubte, seinen Gegner mit seiner musikalischen Vertonung der beiden Gedichte übertroffen zu haben. Quant Theseus / Ne quier veoir ist insofern ungewöhnlich, als dass es für zwei gleichmäßig textierte Stimmen über zwei begleitenden Unterstimmen gesetzt ist. Die Neuheit dieses Lieds und seines Texts mag der Grund dafür sein, dass es von verschiedenen Zeitgenossen Machauts imitiert und zitiert wurde. Gewiss verwendete Machaut seine „Wahre Geschichte“ nicht nur dazu, eine Liebesgeschichte zu erzählen und die Grenzlinie zwischen Wirklichkeit und Erfindung zu umspielen, sondern auch, um sein Talent als einfallsreicher Komponist von Liebesliedern darzubieten. The editions used for this recording are from the forthcoming The Complete Works of Guillaume de Machaut (Yolanda Plumley and R Barton Palmer, general editors), with kind permission of the University of Michigan Press. The music was edited by Yolanda Plumley, Uri Smilansky and Anne Stone; the lyric texts were edited by Yolanda Plumley and Tamsyn Rose-Steel, and translated by R Barton Palmer. Les éditions utilisées pour cet enregistrement proviennent de The Complete Works of Guillaume de Machaut (sous la direction de Yolanda Plumley et R. Barton Palmer), avec l’aimable autorisation de l’University of Michigan Press. La préparation de la musique fut assurée par Yolanda Plumley, Uri Smilansky et Anne Stone; celle des textes des poèmes lyriques le fut par Yolanda Plumley et Tamsyn Rose-Steel, avec une traduction en anglais de R. Barton Palmer. Die Notenausgaben, die für die vorliegende Einspielung verwendet wurden, stammen aus der in Kürze erscheinenden Edition The Complete Works of Guillaume de Machaut (Yolanda Plumley und R. Barton Palmer, Leitende Herausgeber), mit der freundlichen Erlaubnis der University of Michigan Press. Die Notentexte wurden von Yolanda Plumley, Uri Smilansky und Anne Stone ediert; die lyrischen Texte wurden von Yolanda Plumley und Tamsyn Rose-Steel ediert und von R. Barton Palmer ins Englische übersetzt.